John A. 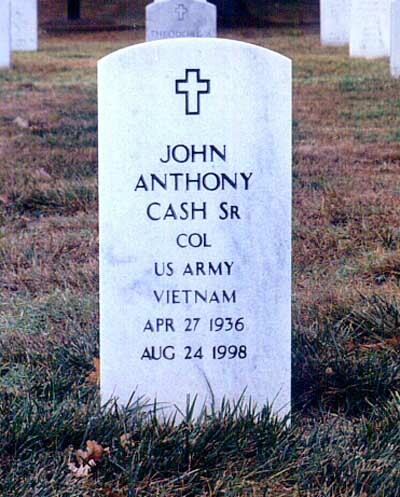 Cash, 62, a retired Army colonel who served in combat and intelligence assignments and as a historian, died August 24, 1998 at his home in Fort Washington. He had hypertension and a heart ailment. Colonel Cash, a resident of the Washington area off and on since the 1970s, retired in 1992 from the U.S. Center for Military History. He wrote two books, "Seven Firefights in Vietnam" and "The Exclusion of Black Soldiers from the Medal of Honor in World War II," and contributed to a third, "Black Soldier-White Army: The 24th Infantry Regiment in Korea." He was a native of Atlantic City, New Jersey, and a graduate of Rutgers University, where he also received a master's degree in history. He received a second master's, in Latin American studies, at the University of Wisconsin at Madison. In the early 1960s, Colonel Lee helped train Cuban nationals for the abortive Bay of Pigs invasion of Cuba. He served as a company commander in Vietnam during the war there, as defense attache in El Salvador and Brazil and as an intelligence officer at the Defense Intelligence Agency. He also taught history at the U.S. Military Academy at West Point and at Morgan State University. His marriage to Alice Cash ended in divorce. His second wife, Cathleen Cash, died in 1992. Survivors include two children from his first marriage, Julie Cash of Atlantic City and John A. Cash Jr. of Washington; a daughter, Martha E. White of Madison, Wis.; a brother; and a sister. On Monday, August 24, 1998, at his residence, loving father of John A. Cash, Jr., Julie L. Cash and Martha E. White; brother of Robert Cash and Helen Cash Jackson. Also survived by two dear friends, Mrs. Alice E. Cash and Eleanor Parris; numerous other relatives and friends. Graveside service will be held on Wednesday, September 2 at 1 p.m. at Arlington National Cemetery with full military honors.